I'm a long-time member and fan of BookBub.com. For those who are unfamiliar with BookBub, they are an online service that scans sites like Amazon, Apple and other booksellers for e-book sales and discount offers, and then they e-mail them to you. I love this service. I know I have downloaded a ton of books that I never would have otherwise been exposed to, just because they were free or offered at a deep discount. Some of them are best-sellers, but most of them are books and authors of which I am unfamiliar. As a result of my impulse downloading, I have a lot of books on my iPad. A lot. So, every few weeks I step aside from my "assigned" reading from book groups or the Read Harder Challenge and check out one of the free downloads the caught my eye. Some of the books are duds (and since they are free, I don't really mind), but some of them have been wonderful surprises. 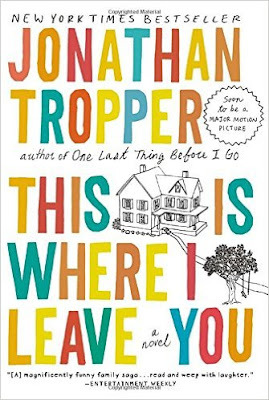 That is the case with this month's book "This is Where I Leave You" by Jonathan Tropper. I know I'm probably behind on discovering this book and author, because this book was a NY Times bestseller. I first became aware of it when it was adapted into a movie a few years ago, which starred Jason Bateman, Tina Fey and Jane Fonda. The movie looked interesting and witty, but I'm not really into movies so I never saw it. But I remembered the movie trailer when BookBub sent me this book title, so I bought it. And I'm glad I did because I really enjoyed this book. It's about a VERY dysfunctional family (four adult children in varying stages of relationships) who all return "home" after their father dies. Upon returning, they learn that it was their father's dying wish for them to sit shiva for seven days. And so they do, and they are forced to deal with all of the family drama that has been avoided for years. While this could be a emotionally draining book, it's actually really funny, which is why I enjoyed the book so much. I liked it so much that I've marked other Johnathan Tropper books in my "want to read" list. Check it out and let me know how you like it!